A Grade II listed windmill has been badly damaged by high winds which have battered the South East of England. 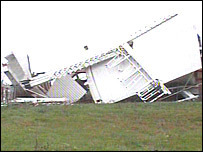 The windmill at Chillenden near Canterbury was blown over in the storms of Wednesday morning. The mill, which was built in 1868, had recently undergone extensive restoration work. A post mill built on stilts, it is believed to be one of just five of its kind in the UK and worked until 1949, when one of its sweeps was damaged in a gale. Restoration work carried out after Kent County Council assumed control for the mill was completed as recently as last year. Margaret Hollier, who is a volunteer at the windmill, said: "The middle strut is broken, it must have been pushed over and broken and so it's gone over to the left as I was looking at it. "It's done an awful lot of damage. "I can usually see it from my gate but I went out to see it and it just wasn't there." Elsewhere in Kent, a fallen tree landed on a taxi on Canterbury Road in Folkestone but the driver escaped serious injury. Other roads in the county were blocked by fallen trees and rail services were delayed after trees were blown onto the lines at Gravesend and Godstone. The torrential rain led to the Met Office issuing a severe weather warning affecting Kent and Sussex and flood warnings for some areas on the south coast of Kent.